Anyone who works in the music industry knows that their ability to hear is probably their biggest asset. A musician’s ears enable them to hear the tiny differences in pitch, rhythm and volume that take notes from simple sounds to exciting, moving, gentle or vibrant music. Sadly, many musicians do not realise how valuable, or how vulnerable, their ears and hearing are until there has been damage done. Many musicians experience hearing loss and tinnitus during their lives, and sadly for most this hearing loss is permanent. A common misconception among musicians is that their instrument is too soft to cause permanent damage to their hearing. Sadly, for most musicians, this is not true, as even a moderate volume for an extended time period can damage hearing- and many musicians also forget to account for the other players in their orchestra or band, who may be producing sound at a louder volume right near their ears! Another common misconception is that a musician would be aware of the hearing damage immediately after exposure if it was happening- but in actual fact, permanent hearing loss as a result of noise exposure often only begins seven to ten years after the time spent in noise. This is why it is so essential for musicians to start protecting their hearing as early in their careers as possible. One way that musicians can protect their hearing is by limiting their exposure to sound. Make sure that volume levels are softer, especially during practices and rehearsals, when volume isn’t so important. It’s easy to download a Sound Level Meter App on iOS or Android phones, which allows you to keep track of how loud your music is. Try to keep levels below 85dB at all times while playing. It is also important to allow the ears time to recover when they have been exposed to loud sounds. After a loud performance, allow the ears 16-18 hours of auditory recovery if possible- this means as little sound exposure as possible, so don’t plan a big practice for the day after a gig. Also allow your ears short breaks during practice sessions and rehearsals to allow the hair cells to recover. 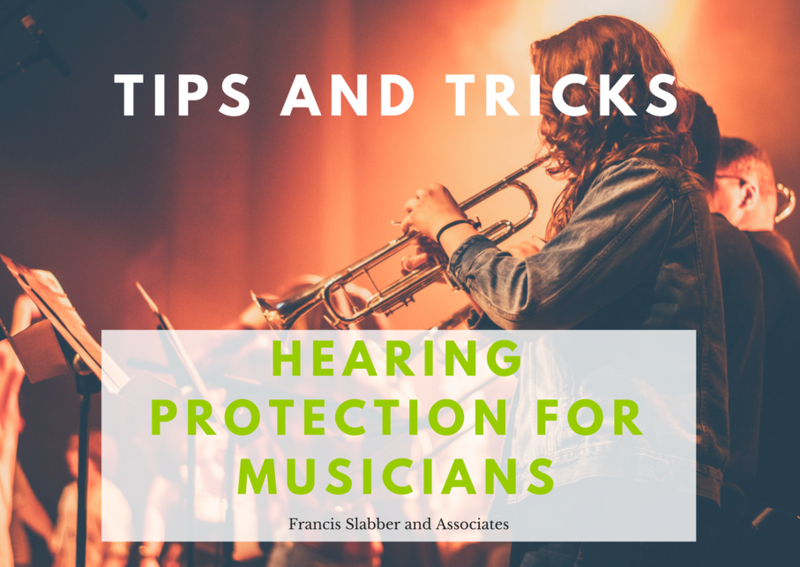 It’s also important to make sure that your ears are protected, especially when playing a gig or concert. There are a range of ear plugs and hearing protection options available- but we know that many musicians reports that they don’t like wearing ear plugs because they alter the balance of the sound coming in. Luckily, there are companies that make ear plugs specifically for musicians, that have special filters that reduce damaging volume without affecting sound balance or clarity. It is best to have these custom made, so you would need to consult with an audiologist to have impressions taken of your ears. This ensures that the plugs fit your ears perfectly, and do not allow any of that damaging sound to leak through into your ears. For those musicians using amplification, in-ear-monitors are your safest option. The monitors send sound straight into your ears, and double as ear plugs. It protects your hearing from external noise and reduces the need for on-stage monitors, which are often loud to allow musicians to hear their playing over the crowd. In-ear monitors can be set much softer, because the sound of the crowd is also reduced, meaning that ears do not get over-stimulated as easily. There are a range of positioning alterations and listening techniques that musicians can implement to reduce their sound exposure. Raising or lowering certain players on stage can mean that sound that was blasting straight into the ears of the musician in front now passes more safely over their heads. Speak to an audiologist about creative ways to limit your exposure and protect your hearing. Because a musician’s hearing is so important, it is crucial that musicians are monitoring their hearing regularly, and consulting with a hearing health care professional about how best to look after their ears. Musicians should have a hearing test performed annually in order to keep track of their hearing status and allow for intervention if changes occur. Even things like excessive wax can lead to permanent hearing loss if left untreated, and the audiologist will be able to identify this and advise you on the safest way to deal with it. Don’t let the music you love limit your career and communication in the future. While some exposure to damaging sound may be unavoidable for musicians, there are steps that can be taken to reduce the long-term effects. Speak to an Audiologist about what your can do to protect your hearing before the damage becomes permanent, or for help on how to manage your hearing if it is already changing. Comment below, or contact us for more information.